Here's another spicy snack that is perfect with a cocktail or a glass of wine before dinner. The amount of heat (cayenne) you add is up to you but I dare you to be brave. The heat from the cayenne is a warm, smoky heat so it won't leave your mouth burning. 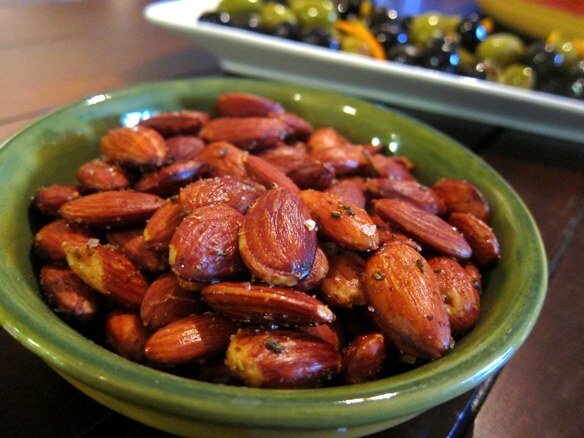 The addition of rosemary gives these almonds a wonderful scent and savoury flavour. Enjoy! 1. Preheat the oven to 350°F and arrange a rack in the middle. 2. Add all the ingredients in a bowl and stir to combine. Spread out almonds in a single layer on the baking sheet. 3.Bake until almonds are lightly browned and toasted, stirring occasionally, about 10-15 minutes. 4.Let the almonds cool on the baking sheet, transfer to a bowl and serve. Love this flavorful recipe, will make a perfect snack! Feel like munching some,flavourful almonds..
Ive seen this on tv and wanted to try them ever since! yum! I needed this recipe! I have a whole bunch of rosemary and had no idea what to do with it! This is a very interesting recipe and for sure is delicious, so i will give it a try. Thanks a lot for sharing. What a beautiful little snack! I want to make this for an upcoming bridal shower!